Ever since Ariel was fifteen years old, she would escape her father's surveillance, the King of the Under-the-Sea world, and swam to the surface. She liked to sit on her favourite rock every night, half a mile distance from the shore. She always looked up to the sky and smiled at the Moon. When the Moon was full, cloudy or not, it would tell her stories about the world that was outside the sea, warming her in its faint light, making of Ariel a distinctive spot of an otherwise lonely location. Ariel was a mermaid. Mermaids were thought to be legendary creatures. Half human, half fish, and with a voice that would enchant and drive crazy in love any man that would hear them sing, mermaids hadn't been seen by humans since centuries ago, and so they had been forgotten. That particular night, the Moon was explaining this when Ariel saw something in the distance. It was a ship, worryingly close to the storm near her. She loved being showered by the rain, but this was very different to those creatures called humans. The Moon had told her that there were storms so wild, they would break their ships causing the people inside to drown. This seemed to be what would happen tonight. Ariel's fingers were clenching in anxiety while observing, and finally, the inevitable happened: a lightning struck on the ship, starting a fire, and while some people tried to suffocate it, others, pushed by waves that grew high as to reach gunnel, struggled to avoid falling in the sea. There was tension and screaming at the ship. 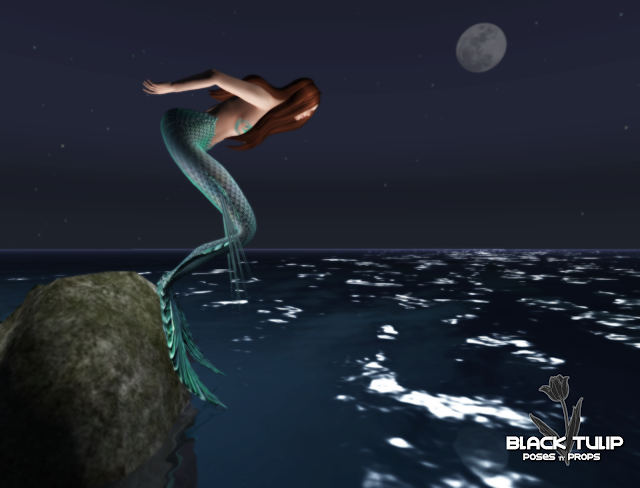 Ariel could not stop looking and the Moon reminded her that her father would be quite angry if humans would see her, that mermaids were not to interfere in human life. Upset and uneasy, doing her best to ignore the knot that was tying tight in her stomach, she was ready to dive back home and so she stood up. Then, another wave pushed the ship, and this time she saw a man falling in the sea. It happened so fast that before Ariel realized, she had jumped towards the ship and was swimming to rescue the man. Only when she reached that half conscious human, the words of her father resonated loud in her mind. "Do not intervene in human affairs!" She shook her head trying not to hear them, and swam driving the man to the safety of the seashore. She waited until he opened his eyes, laying next to him, and when he did, she smiled and told him in the sweetest voice ever heard, "I'm so glad I was there to help you! How are you feeling?" The man stood up, his eyes widened in horror at the sight of the half-fish creature, and walked back a few steps. "What, what... What are you? That's not possible! You're a monster!," the man said. He reached the gun that was still held by his belt, and despite wet, he could use it and shot Ariel on her shoulder. She screamed in pain and fell. "But, but... But I've saved you!," Ariel said, unable to understand, crying. The man shot again, this time on her chest. Her eyes clouded and she fainted. The man shot a third time and there would have been a fourth one, hadn't it been for Ariel's father showing up on the seashore after the Moon called him saying it was urgent. Her father took the gun from the hands of the scared man and urged upon him to leave fast. Once the man disappeared from his sight, he threw the gun in the depths of the sea, took dying Ariel in his arms, and went back home with her. Weeks after, Ariel opened her eyes. She was still convalescent and the injuries hurt. Her father was sitting next to her, he had been doing after their doctors extracted the bullets and cured her injuries the best they could. He smiled only for a second, then his stern look was back. "Ariel," he said, "there's a reason why we don't intervene in human's affairs. They're a species of fearful violent creatures that attack what they cannot understand. Your intentions don't matter. They only see a strange creature to destroy and we have to protect ourselves from them." One tear trickled down Ariel's cheek. She knew what would happen now. "Now, there's the matter of the rules. You know them. If I am to expect for others to abide by my rules, I have to set an example by punishing my own daughter who broke them. I can't make an exception with you. You know what happens at this moment." Her father was strict in applying the rules, and no matter her good intention when saving that man, no matter her promising she wouldn't break them again, Ariel was punished and cursed to eternally be the Watcher of the Sea. Always on duty to help drown those humans that would fall in the dark waters, she would be an invisible shadow to their eyes, singing to their ears while holding them and pushing their lives down in the depths of the silent sea.